édité le 22/03/2019 - Plus de news de "Petronas" - Voir la fiche entreprise de "Petronas"
Petroliam Nasional Berhad (PETRONAS) has awarded Block PM407 and Block PM415, approximately 160km offshore Peninsular Malaysia, to PTT Exploration and Production Hong Kong Offshore Limited (PTTEP HKO), a wholly-owned subsidiary of PTT Exploration and Production Public Company Limited (PTTEP) and PETRONAS Carigali Sdn Bhd (PETRONAS Carigali), a wholly-owned subsidiary of PETRONAS. A signing ceremony for the Production Sharing Contracts (PSC) and Joint Operating Agreement (JoA) for the Blocks, awarded as part of the 2018 Malaysia Bidding Round, was held here yesterday. 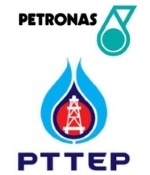 PTTEP HKO is the operator for both Blocks, with a participating interest of 55 percent for Block PM407 and 70 percent for Block PM415, while PETRONAS Carigali owns the remaining 45 percent and 30 percent in the respective Blocks. Signing respectively on behalf of PETRONAS, PETRONAS Carigali and PTTEP HKO were the Vice President of Malaysia Petroleum Management (MPM), PETRONAS, Muhammad Zamri Jusoh; Vice President of Exploration, Upstream, PETRONAS, Emeliana Rice-Oxley; and Executive Vice President, Geosciences, Subsurface and Exploration Group, PTTEP, Kanok Intharawijitr. Witness for the signing were Senior Vice President, Business Development 1 Division, PTTEP, Chalongrut Ya-anan; Head of Legal, MPM, PETRONAS, M Ilhami Idris; and Head of Legal, PETRONAS Carigali, Azizi Md Ali. Malaysia Bidding Round is an event organised by PETRONAS to market Malaysia’s acreages to existing and new companies who are interested in conducting exploration and production in Malaysia. Voir la fiche entreprise de "Petronas"
Les dernières news de "Petronas"
Toutes les news de "Petronas"